Artificial Intelligence And Machine Learning In Medicine: Hope Or Hype? 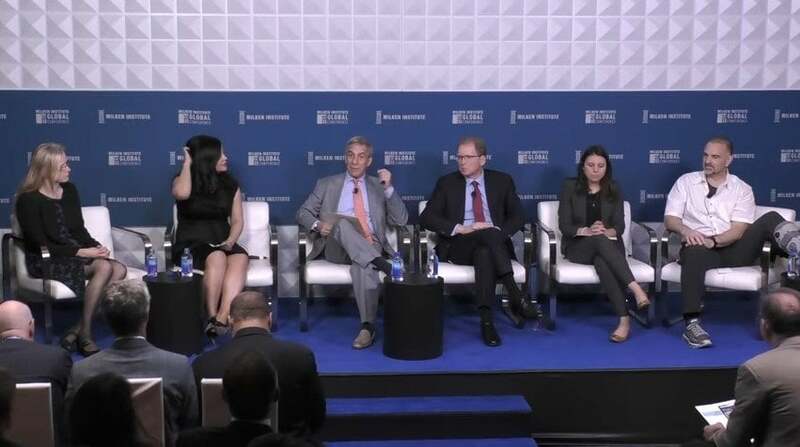 Milken Conference: Artificial Intelligence And Machine Learning In Medicine: Hope Or Hype? Applications of artificial intelligence and machine learning to health care and research have been exploding over the last year—and sometimes backfiring, as researchers negotiate the learning curve. There is great hope, however, that these technologies will reduce drug discovery times and ultimately enable precision medicine. Is a computational approach the awaited disruption that will speed time and lower costs of research and development? Or will human biology outsmart our best efforts to decode it algorithmically? What's the problem with Watson OK. If you give you we all know if you feed an encyclopedia into a computer the computer can spit it out probably better and faster than any human so we can win a Jeopardy. If you have patterns that are easily learnable by a computer like learning how to play chess eventually a machine learning computer will do better than a human being. What's the problem in healthcare. The problem in healthcare is there's no encyclopedia to feed the computer. We don't know what causes most diseases and what they call the medical record the medical record is not like an encyclopedia that has all your information. So the computer to make a judgment for a human patient is basing it on nothing because even the best most of the best electronic health records that now exist are woefully short. There's just a few examples of useful electronic medical records in the entire field. So it's sort of like asking a chef the greatest chef in the world to make try to make a gourmet meal out of garbage. Ok it doesn't matter how good the computer is. It's mostly dependent on how good the information is that you can feed it. And in this field of healthcare and big data you've got to understand what's limiting computational approaches are not what's limiting. Great breakthroughs this brilliant computational biology. I'm not saying that the best ones are going to yield the best product but we need big data in this field and that's what's really missing and that's why an approach like Watson has no chance in hell right now because we don't have big data in this field. It's a cautionary tale in what Washington has done. And when one wants to that wasn't cautionary enough for it to show us the problem it shows the problem when you put may be very good for all we know very good computational type people and so forth. Involve them in a process that they really don't understand the sort of the problems the limitations of the morasses of Current Biology biological sciences and the healthcare system and why in any system that you study it's always most important instead. What's the limiting bottleneck and limiting bottleneck is not AI and it's not machine learning and all that it's really good big data which right now doesn't exist in the field. Does anyone here take issue with the way George presented the. Does anyone here think think Watson is something we should be excited about. No I don't think anyone would say that. So I mean from inference here. So I agree with yours that data is the limiting factor. But here is actually the hope which is we have the ability to go and collect a lot of the data that we do need today. There are technological investments from being able to sequence your entire genome for every individual here. We could also look at entire Lippitt panels proteome panels and yes Emaar records as there traditionally collected are horrible but we can do a better job of collecting great clinical records. I work with a foundation called the most research foundation and they have a registry on 15 patients where they've gone through and collected really great longer to know clinical grade records where we know for every month my patient what their progression Pfieffer survival is overall survival. Other clinical measures and biopsies collected at the time of diagnosis where we've done whole genome sequencing where we know it's the expression of that protein that tumor RNA as in other molecular factors. And from that date we can start to tease out that via the computation. So it's not just about patterns so that was the second thing yes data is one but the other is being able to go beyond patterns to learn cosily what's driving the system. So in medicine it's not just enough to be able to go hey you've clicked on this many things and your favorite shoe is Valentino versus I don't know what it's not about pattern recognition. It's really about teasing out the mechanism and the causes and we can use statistical frameworks. That's what I use in my research that learned causality directly from data that were the machines common is it allows you to do it at scale and you can do it over many variables and over many Haitians. And so the hope today is that we start to mobilize to collect the data that we do need. So we can get to the insights that were really impact patience and allow us to do a better job of figuring out that treatment matching you're talking about oncology. So it's all biologically driven so if you haven't had the machine mutational data across many patients you're not going to be able to accurately produce and predict what the right treatment option is for that individual. Let me jump to Rowan when I think of you know when you think of IBM you think of a very traditional company it's been around a long time you think of that with Jane Jane part of your role. JJ is to help the company break from tradition. What. Can you talk a little about that and what are some of the challenges you have. Absolutely. So when people think about Johnson Johnson they think of them people think about baby capful spurts of Cool J has.